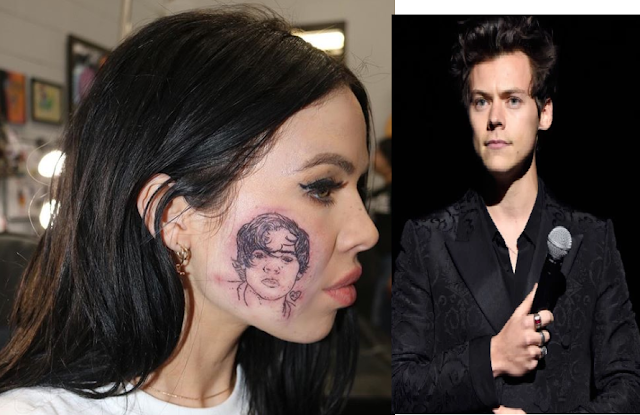 The 24-year-old New Zealand born singer Kelsy Karter posted a photo of her with a portrait of former One Direction star Harry Sytles on her face. Karter gives credit to the LA-based tattoo artist Romeo Lacoste for doing the art right at her cheek. "Mama, look what I made me do,"she wrote a caption oh her Instagram post. Speculation had surfaced online saying all are publicity for the singer's latest single Harry. However, Karter clarify things saying the tattoo was completely unrelated to the song's launch. Karter earlier this month declared Harry Styles as the best looking human. She did it because "I'm a big fan of Harry and I'm not afraid to express it and I honestly don't know how to do anything half-arsed," She said. In an interview with i-D in 2018 she said: "What I love about him from a professional standpoint is that he was the poppiest of pop stars, and then he went off on his own and made a classic rock album. "I also just want his career. "I feel like I'm a female version," She said. The tattoo got different reactions from fans on Karter's Instagram.